Two new music video games are wildly popular and almost identical. Which one wins? In the beginning--that is, November 2005--there was a video game called Guitar Hero, in which players jammed on a fake plastic guitar along with real rock songs. And it was good. But not good enough. A year ago, the rival Rock Band added drums, bass and vocals. 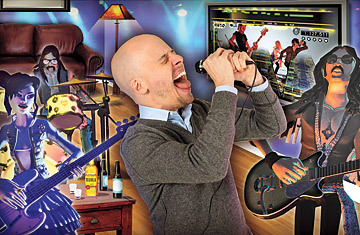 Now there are two improved versions that feature the full instrumental lineup: Rock Band 2 and Guitar Hero World Tour.